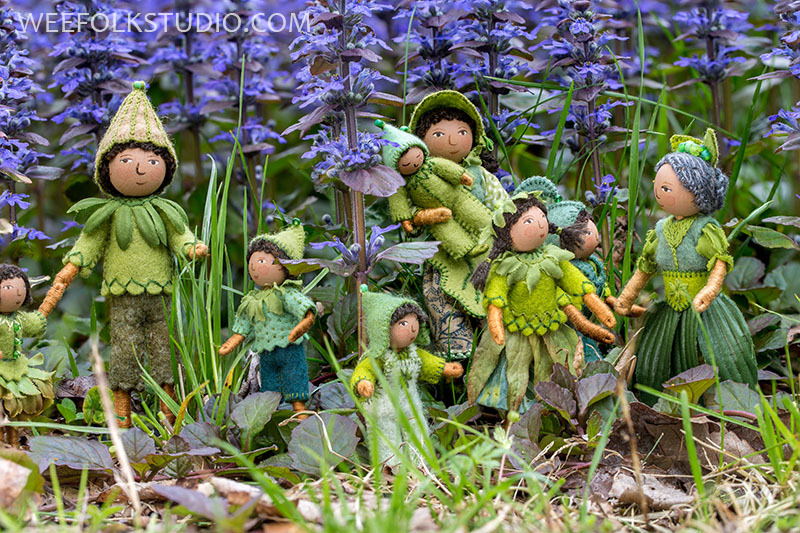 The whole Woodland Folk family recently ventured out into the bugle weed forest for some fresh air. Ever since they had the excitement of posing for my new book, it’s been dismal for them, all cooped up inside. The wee folk couldn’t get enough of the natural surroundings! 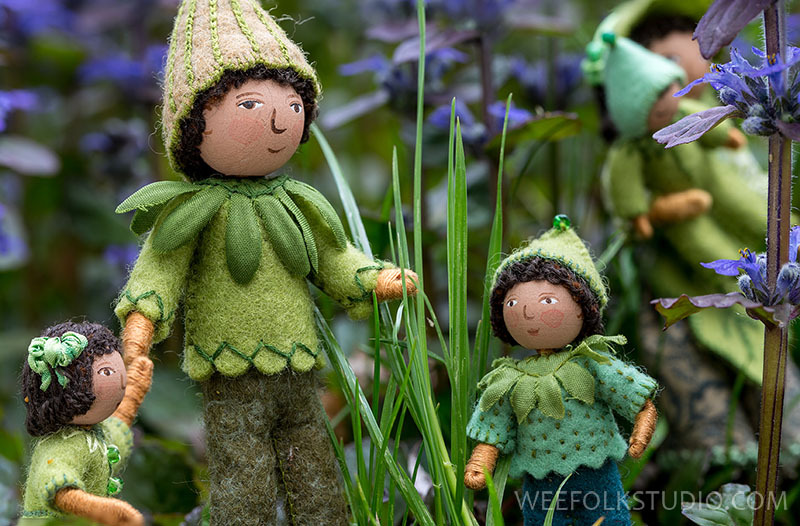 Many of you have made your own versions of these dolls by following the directions and patterns in Felt Wee Folk – New Adventures. I hope that you are having as much fun as I am! The book is available through your favorite book seller or from my Etsy Shop (autographed, with extra goodies). 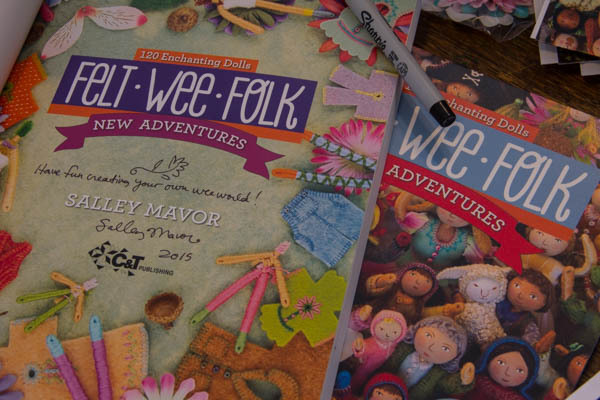 This entry was posted in 2nd edition, Dolls, Felt Wee Folk, Wee Folk by Salley Mavor. Bookmark the permalink. I can tell by the expressions on their faces that they’re very happy to be outside. It reminded me of the story on All Things Considered tonight about taking a kindergarten class outdoors (Out of the Class Into the Woods). So much for them to learn outside. As usual, these are breathtaking! 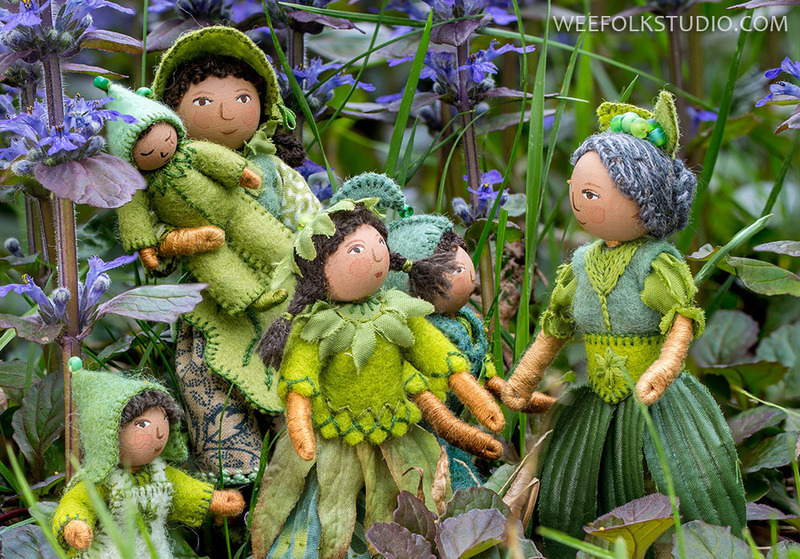 Your Wee Folk and their surroundings are ‘living’ examples that burst with your fabulous imagination and the joy you take from the details of our world. Drinking in each tiny layer of one of your photos is endlessly fascinating. Thank you so much for sharing your visions with us; the charming, the humanistic and the political. Thank you for letting the Wee Folks make an appearance again :)!! Today I GREATLY needed a break from the weeks of Political Chaos, Media Noise, and all the mind boggling Human Craziness, which seems to occur daily. How sweet of you to remind us, to seek out moments, and places,..even if it is in our imagination.. in our back yards, gardens or neighborhood parks.. where Playfulness and Imagination still reign.. and if we are lucky..we may discover, the Magical Wee Folks families, who live hidden among the flower beds and bushes.. GOD Bless You.